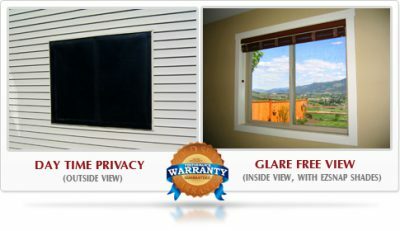 Privacy without blocking your view! There are few things more annoying than having your neighbors or people walking by staring through your windows. Closing the blinds or drawing the curtains works, but it also eliminates your view outside. When people think of getting more privacy on their windows without blocking their view, window privacy tint comes to mind. There is a better solution though; EZ Snap™ exterior shades. Both window tinting privacy film and EZ Snap™ shades will give you daytime privacy from the outside. Both do this without blocking your view from the inside. So what’s the big difference? At night time, the window privacy film turns your windows into giant mirrors, making it hard to see through to the outside. The reflective qualities of the film are now working against you and reflecting back all your interior lighting. EZ Snap exterior shades do not do this at all and so you still can enjoy your night time views. Another big advantage of using EZ Snap™ exterior shades over a window privacy film, is that it prevents bird strikes into your windows. As mentioned in our previous blogs topics, privacy or reflective window tint, actually increases the likelihood of birds flying into your windows. Privacy window film makes your windows more reflective. It’s the reflectivity of the window that makes the glass invisible to flying birds. 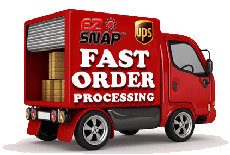 EZ Snap™ makes the window look like a solid surface to flying birds and so they do not fly into it. So now you know how to increase your privacy and reduce bird strikes at the same time.